Konnyaku is Japanese traditional food made of konnyaku potato. The texture of konnyaku is like hard jelly. It smells but there is not much taste. The store bought ones are usually rectangular solid block or noodle called shirataki. 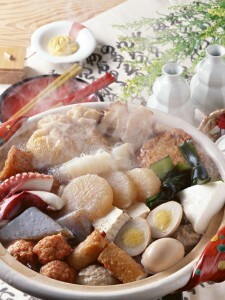 They are often cooked in oden or nabemono (both are hot pot). Besides hot pot, konnyaku is put in stir fry or simply grilled and eaten with miso sauce. Konnyaku has almost no calories and it’s very high in fiber, so you can easily feel satisfied. 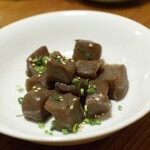 It’s popular as a diet food; konnyaku fruit jelly and konnyaku noodle are especially well eaten.